The drones and chips that U.S. manufacturers can sell commercially are about to become a lot more capable. The State Department has announced that it will relax rules on the sale of some key technologies that were seen as highly sensitive to national security, including chips that will play a big role in 5G telecommunications devices, as well as some types of sense-and-avoid radar for drones and drone autonomy software. The biggest change is the move of certain types of Monolithic Microwave Integrated Circuits, or MMIC, chips from the Defense Department’s strictly regulated U.S. Munitions List to the Commerce Department’s less stringent Commerce Control List. That may sound dull but it could affect how consumers around the globe use future cell phones. Less advanced MMICs already play a big role in commercial cellular devices. The military uses more advanced ones in radar and other communications for advanced beamforming — essentially, a way to more efficiently transmit information over relatively weak signals. That capability will be crucial to the 5G network, whose distributed networks will allow higher data rates for future cell phones, sensors, and the internet of things in general. Higher data rates, in turn, will allow for things like better video transfer, better geospatial positioning, and more apps and processes running in the background on communications devices. The advanced MMICs that are necessary for 5G communications “use quite a bit less power than the ones we use in the military arena” for radar and other applications, a State Department official told reporters on Friday. On drones, the rule change means that companies that are making unmanned vehicles with anti-collision radar, or the radar itself, have a lot more room to sell them. That will enable the sale of a variety of new commercial drones, such as so-called hunter-killer drones for security purposes that can detect and disable other flying robots, such as the Dronehunter from Fortem technologies featured in the video below. 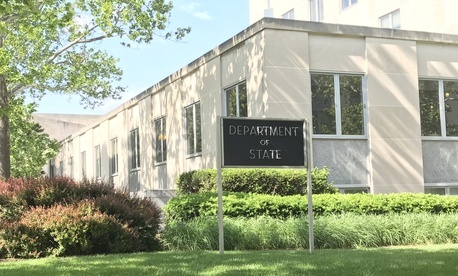 A State Department official said that the rule change was simply catching up to technological reality. “There’s been a longstanding understanding that airborne radar was a military capability. Why would anybody else need airborne radar?” said the official. The new rules still restrict the commercial sale of air-to-air radar that’s too good. The accuracy rate is limited to a range of 8 nautical miles, with a refresh rate of 1 hertz or less, and a power level beneath 850 watts.